An armed robbery suspect at about 3:00 am Thursday August 2, shot the head of a male member of a household he forcefully found his way to rob at Oil Road in Jeddo,Okpe Local Government Area in Delta State, Fresh Angle International can authoritatively report. 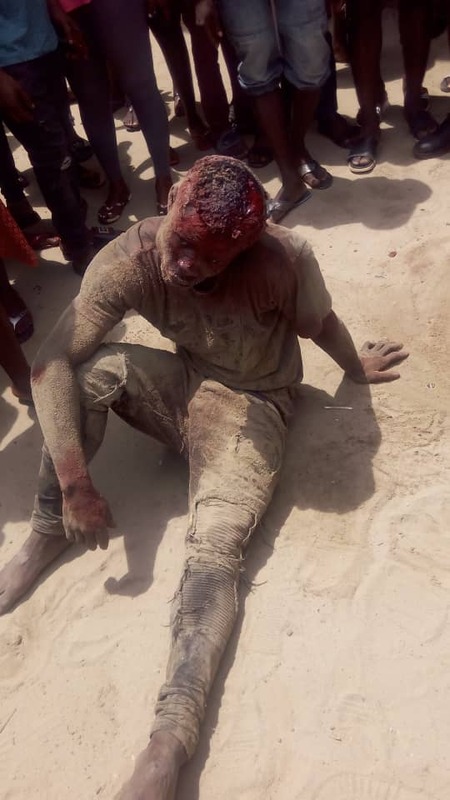 The suspect identified simply as Peter who was said to have gained freedom from Warri Prison about a month ago, shot the head of the young man in seeming retaliation after suffering cutlass cut on the roof of his head from the victim. An unsatisfied Peter who was given N 80, 000.00 (Eighty thousand naira) and two mobile phones by the family from their home's burglary proof with a plea that they had no other money, forced his way into the victims' house. Unknown to him, the eldest son of the home positioned himself for possible eventuality from the greedy robbery suspect. Immediately the armed robber burst into the house, the eldest son of the home who laid ambush, used cutlass on his head and the trigger happy hoodlum responded by shooting the head of his"attacker". In the process, the robber's bullet struck the hand of mother of the home. Fresh Angle International gathered that the ambushed thief who escaped with the huge cut on his head, was later apprehended by Jeddo Vigilantee at about 1pm same day (Thursday August 2) at the back of Jeddo Primary School. The suspect who was battling to survive was placed at the front of Jeddo Town Hall by the Vigilantee as at 2pm today when this report was filed, while the boy that he shot was said to have been rushed to hospital for medical attention, even as the victim's mother continued to shoot in pain for her son's survival. Your soar away International Tabloid leant that Peter,an ex convict robbed an Alhaji of N700, 000.00 just last week at same Oil Road Jeddo and robbed a poultry owner as well. The police team that reportedly rushed to the scene with a view to seeing things for themselves, left with a promise to return as at the time of this report.